Lovely Condo is located in the highly sought after Nepenthe community. 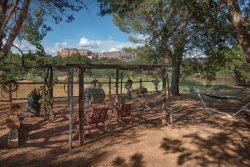 This Condo is turn key and ready for you to move in and enjoy your vacation and the wonders of Sedona. It has comfortable, tasteful furnishings and is very well appointed with kitchen and bath amenities. The Condo is close to everything Sedona has to offer. Many choices for dining, shopping and hiking are only a short distance away. On sunny days you can opt for your private patio or take a jaunt down to the community pool and hot tub. This is very friendly, welcoming community! Pets permitted. This Cliff Rose Condo provides everything you need for a comfortable, enjoyable vacation! Good responses & follow up. Sales and support team members are client focused. The internal forwarding of calls and voicemails needs an upgrade. Overall, the "Nepenthe" Development is well maintained and a pleasure to walk through. Also, our individual unit was clean and easy to enjoy.